Our development team is excited to present UO Evolution. Our world is a dynamic adventure that will challenge even the best players. Our Staff and Scripters are all professional and mature…we all have a passion for Ultima Online and work on this shard to provide the most enjoyable gaming experience possible. Make sure you take the time to watch the video below and download the custom client+patch to see all the new artwork, buildings and mounts. If you log in without the proper patch and see the wrong images, you missed a step somewhere. Our shard is very unique and has 1000s of custom scripts and totally new graphics for the monsters and mounts that you have never seen before… it's well worth the effort! In order to connect to the Ultima Online UOEvolution shard, you must first have a couple of programs installed, along with the Microsoft .Net Framework. The video below will explain the steps you need to get playing quickly. Patching your UOE custom client is highly recommended to play on UO Evolution. Without the proper patch, you won't be able to see the custom buildings, clothing, items, mounts and colors. You need the microsoft .net framework to run properly. Most new computers will have this software, if you have an old operating system you may have to download. New players need to download our custom client+patch with this easy auto installer. The following links are to the same UOE patch, but you have to install manually and does not have the auto installer included in the package. If you don't already have UO Steam Download or Razor Download download it now. Unrar/Unzip the downloaded patch/client into the Games folder, it will auto create a folder called "UOEvolution Custom Client"
Open UO Razor, AssistUO or UO Steam and log in. You can now create your account. NOTE: This UOE Custom Client will be a separate client download, and will not effect any other clients you may have on your computer. This new UOE client+patch can be used only to connect with the custom UO Evolution Shard. 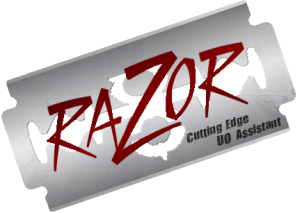 UO Steam and Razor are easy Client Loaders and helps make game play much easier with the added use of hotkeys, macros, and much more. NOTE: When loading these programs, start by right clicking the icon on the desktop and select "run as administrator"
Connecting to the game is as easy as ever, all you have to do is make up an account name, and password. You will then be allowed to create your character and move into the game world. NOTE: if you are running the operation system Vista Or Windows 7 you many need to right click the program and select "run as administrator"
Many old players asked for an expanded hue file with more color choices, so we made this new file for you to add to your existing patch. You only need this IF you have our old client. If you have recently downloaded our patch/client it is already included and installed!